How Will Global Tapering Affect Investors? The depth of the global financial crisis of 2008 and 2009 forced many central banks to use unconventional monetary policies, including quantitative easing. Under these programs, central banks purchased government bonds and private sector securities to stimulate the economy and inject liquidity into the financial markets. Low inflation has encouraged central banks to keep these policies in place through 2016 and 2017. The U.S. Federal Reserve began tapering its balance sheet in October of 2017 with a $4 billion per month roll off of in its holdings of mortgage-backed securities. The central bank’s holdings of these securities hit an all-time high of about $1.78 trillion in May of 2017. In January of 2018, the central bank plans to increase the roll off to $8 billion per month and eventually ramp it up to a maximum of $20 billion per month in October of 2018. In Europe, European Central Bank (ECB) President Mario Draghi announced in September of 2017 that the Governing Council would decide whether to taper its €60 billion per month quantitative easing program in the following month. The Euro Area inflation rate reached 1.5 percent in August and September, which remains below the central bank’s two percent target rate but was better than many economists had been expecting. The Bank of Japan (BOJ) has also started reducing its bond purchases to an annual pace of around ¥50 trillion ($443 billion), which is below its loose pledge to keep it at around ¥80 trillion. Unlike the Federal Reserve, the BOJ doesn’t tend to announce its plans ahead of time in concrete terms, which means that the market often discovers changes after-the-fact. Regulators anticipate reaching a 2 percent inflation rate in 2019. Quantitative easing is a new approach that central banks took during the 2008 financial crisis, which means that there is no historical record of the effects of tapering in the aftermath. But in theory, a reduction in asset purchases will reduce aggregate demand and the reduction in demand will result in a lower price, assuming that everything else is held equal. The big question is the magnitude of the price declines. The impact of the Federal Reserve’s quantitative easing program was a 120-basis point reduction in bond yields in 2013 that reduced the unemployment rate by 1.25 percentage points and increased inflation by 0.5 percentage points. 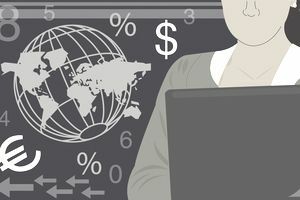 At the same time, the research shows that the program may have increased U.S. equity prices by 11 to 15 percent and reduced the dollar’s effective exchange rate by 4.5 to five percent. The good news for investors is that tapering these programs will not likely fully reverse those gains. The scale of the tapering is much smaller than the scale of the inflationary period, while central bank balance sheets will likely remain permanently larger than before the crisis. The central bank has also been sure to clearly communicate its plans to avoid the “Taper Tantrum” that occurred in 2013, which means that the tapering may already be priced into the market. The impact of global tapering is expected to be relatively benign early on, but investors can still hedge their bets using a variety of strategies. One strategy is to ensure that your portfolio is properly diversified, which helps mitigate the effects of tapering in any specific market. For example, the 2013 Taper Tantrum resulted in a sharp drop in Treasury bond prices and a sharp spike in yields. The effects were only temporary, but investors that were diversified into other fixed-income asset classes like corporate bonds or emerging market bonds would have been more insulated. Investors can also hedge their portfolio against broader declines using options or other financial instruments. For example, an investor might purchase long-term puts on the S&P 500 if they believe that the market is at risk over the next year from tapering activity. These puts will experience a gain in value if the S&P 500 moves lower, which should help offset any losses in long stock positions in the same index. Finally, investors can fine-tune their fixed income exposure using bond ladders, which are used to manage interest rate risk. The easiest way to ladder bonds if you’re not a high net worth investor is to purchase bond ladder exchange-traded funds (ETFs) that hold a diversified portfolio of bonds that have staggered durations and yields. International investors should be aware that many of the world’s largest central banks are beginning to taper asset purchases. While tapering won’t fully reverse the gains produced by quantitative easing, there could be modest downward pressure on the prices of the assets, depending on the amount of tapering. Some economies may be more at-risk than others given the differences in the way that they disclose tapering plans.